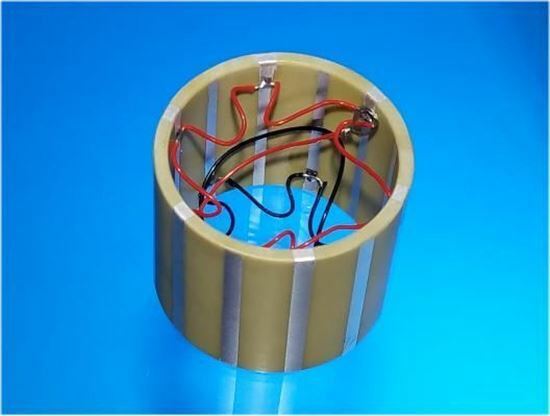 Piezo Tube Striped Electrode 17 KHz. Radial mode vibration. Among its application are Underwater communication, Ultrasonic Sensor, Vibration Sensor, Pressure sensor, Vibration generation, Piezo expansion sensor and compression sensor. - The direction of polarization is circumferential. - It is poled between stripes. The Silver stripes with Red dots are the "+" and the Yellow color Piezo strips are the "-".